The barber's trade is an extremely ancient one. Razors have been found among relics of the Bronze Age (circa 3500 B.C.) and barbering is mentioned in the Bible by Ezekiel who said "And Thou, son of man, take thee a barber's razor and cause it to pass upon thine head and upon thine beard." Shaving, either of the head or face, was not always a voluntary act, for it has been enforced by law in England and elsewhere. Cleanliness and vanity were therefore not the sole reasons for a 'clean shave', the origins lie deeper. 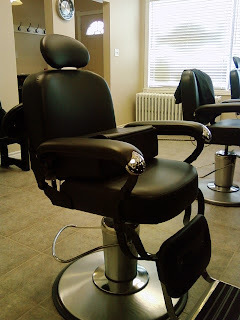 Barbering was introduced to Rome in 296 B.C. and barber shops quickly became very popular centres for daily news and gossip. All free men of Rome then had to be clean-shaven while slaves were forced to wear beards. It is from the Roman (Latin) word 'barba', meaning beard, that the word 'barber' is derived - and hence 'barbarians' as the name used during that period to describe tribes who were bearded. When Caesar landed in Britain in 54 B.C. he found that the Britons wore no facial hair at all, except on the upper lip. Similarly, at the time of the Norman Conquest, Harold and his men also had their chins 'reaped' as the Saxons termed it; an expression no longer in use except by the harvester. At a later period full beards came into fashion. The barbers of former times were also surgeons and dentists. Most early physicians disdained surgery, and therefore, as well as haircutting, hairdressing and shaving, barbers performed surgery of wounds, blood-letting, cupping and leeching, enemas, and the extraction of teeth. Thus they were called 'Barber Surgeons' and they formed their first organisation in 1094. Barbers were chartered as a guild by Edward IV in 1462 as 'The Company of Barbers'. The surgeons formed a guild 30 years later and the two companies were subsequently united by a statute of Henry VIII in 1540 under the name of 'The United Barber Surgeons Company'. During the reign of Henry VIII the authorities of Lincolns Inn prohibited wearers of beards from sitting unless they paid certain penalties. Queen Bess went one better: in her reign a law was passed that the wearer of a beard of more than two weeks' growth should be taxed according to his station in life - a man in a lowly position was taxed to the extent of 3s. 4d. per annum for growing whiskers! So taken was Peter the Great with this enactment that he introduced the law into Russia. In Ireland it was enacted that, in order to be recognised as an Englishman, a man must have all the hair above his mouth shaven. And this law actually remained in force for two hundred years! In 1745 surgeons were separated from barbers by acts passed during the reign of George II. The surgeons with the title of 'Masters, Governors and Commonalty of the Surgeons of London'. This body was later dissolved and replaced by the Royal College of Surgeons in 1800 during the reign of George III. 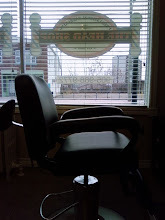 The origin of the barber's pole is associated with his service of blood-letting. The original pole had a brass basin at its top representing the vessel in which leeches were kept and also that which received the blood. The pole represented the staff which the patient held onto during the operation, with the red and white stripes portraying the bandages - red for blood stained and white for the clean ones. 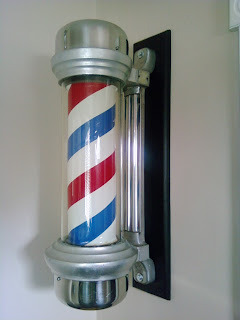 Being hung out to dry on the pole after washing, they would often blow and twist together forming a spiral pattern which lead to the subsequently painted barber's pole of red and white stripes. "It was better you were never born, than on the Sabbath pare hair or horn"